Portuguese is the mother tongue of about 170 million people, mainly in Portugal and the Portuguese islands in the Atlantic, Brazil, and Portugal's former overseas provinces in Africa and Asia. Pimsleur's Brazilian Portuguese teaches the Sao Paulo dialect of Brazilian Portuguese. 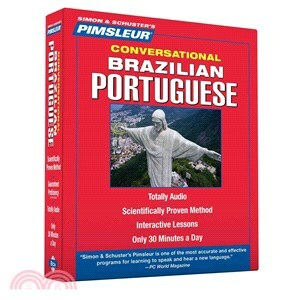 Pimsleur's Conversational Brazilian Portuguese Program ‧Sixteen 30-minute lessons of spoken Brazilian Portuguese language learning (the first sixteen Units of Pimsleur's 30-Unit Brazilian Portuguese Comprehensive Program). ‧Essential grammar and vocabulary that teach you greetings, numbers, how to order food and drink, deal with currency, scheduling a meal or meeting and to give and ask for directions. Learn to speak with near-native pronunciation skills. ‧No mindless repetition! Converse with native speakers in natural (and useful!) conversations. ‧Fasy, fast, fun and effective language acquisition. ‧No computer necessary! Unlike expensive software programs which tie learners to a computer, Pimsleur courses are available in CD or mp3 format to meet your needs. ‧Receive an instant credit of $150 to trade up from the Conversational to the full Level 1 Comprehensive CD course.